A University of British Columbia geophysicist is part of a NASA mission that is analyzing the first sets of data being collected by MESSENGER as it orbits Mercury. The spacecraft is capturing new evidence that challenges many previous assumptions about our innermost planet. Analyses of new data from the spacecraft reveals a host of firsts: evidence of widespread flood volcanism on the planet’s surface, close-up views of Mercury’s crater-like depressions, direct measurements of the chemical composition of its surface, and observations of the planet’s global magnetic field. Mercury is covered with mysterious bright patches, depressions that are unlike anything seen before in our solar system. NASA’s MESSENGER spacecraft has sent back high-resolution pictures of the “pits” that may have been formed by processes still active today. After only six months in orbit around Mercury, NASA’s MESSENGER spacecraft is sending back information that has revolutionized the way scientists think about the innermost planet. New images from the spacecraft reveal landforms on Mercury suggesting a previously unrecognized geological process. Images of bright areas appear to be small, shallow, irregularly shaped depressions. 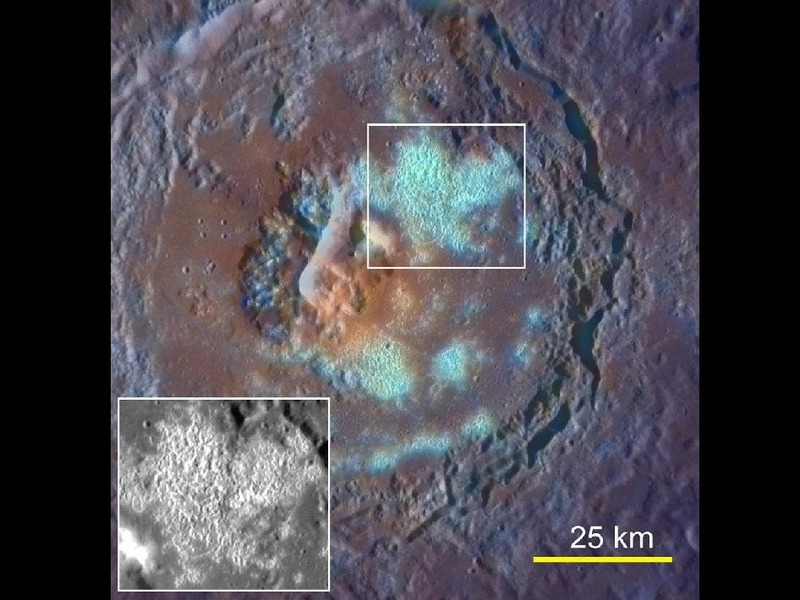 The science team adopted the term “hollows” for these features to distinguish them from other types of pits seen on Mercury. Hollows have been found over a wide range of latitudes and longitudes, suggesting that they are fairly common across Mercury. “Analysis of the images and estimates of the rate at which the hollows may be growing led to the conclusion that they could be actively forming today,” says David Blewett of the Johns Hopkins University Applied Physics Laboratory (APL) in Laurel, Md., lead author of one of the reports. Each such “hollow” is between tens of meters to a few kilometres across and looks fresh and young – by planetary standards. Also, scientists for decades had puzzled over whether Mercury had volcanic deposits on its surface. New data show a huge expanse of volcanic plains surrounding the planet’s north polar region. These continuous smooth plains cover more than six percent of the planet’s total surface. The deposits appear typical of flood lavas, or huge volumes of solidified molten rock similar to those found in the northwest United States. “If you imagine standing at the base of the Washington Monument, the top of the lavas would be something like 12 Washington Monuments above you,” said James Head of Brown University, the lead author of one of the papers. Scientists also have discovered vents or openings measuring up to 16 miles (25 kilometers) across that appear to be the source of some of the large volume of very hot lava that has rushed across Mercury’s surface carving valleys and creating teardrop-shaped ridges in the underlying terrain. Elsewhere, University of British Columbia's Catherine Johnson, an expert in planetary magnetic and gravity fields, along with colleagues at Johns Hopkins University’s Applied Physics Lab, Goddard Space Flight Centre, University of Michigan and the Carnegie Institution, analyzed the data collected by the spacecraft’s magnetometer to detect Mercury’s magnetic equator and paint a never-before-seen picture of Mercury’s magnetic field. Mercury is the only other planet in the inner solar system besides Earth whose global magnetic field has an internal origin. The strength, position and orientation of the dipole field determine how the solar wind interacts with the planet. A stronger magnetic field holds the solar wind at bay. Mercury’s weak magnetic field allows solar wind to reach the planet’s surface, creating a ‘sputter’ effect–an ejection of atoms of individual mineral crystals–that are then carried away from the planet’s surface. Mercury, the solar system’s smallest and densest planet, is in many ways is the most extreme.